In large bowl with electric mixer, beat butter, sugar and lemon extract on medium speed until light and fluffy. Add flour and almonds; beat on low speed until well blended. Cover; refrigerate at least 1 hour for easier handling. Heat oven to 375°F. 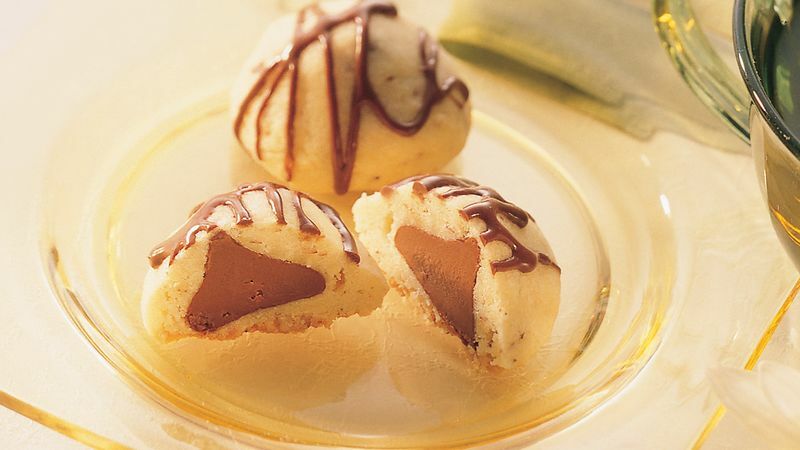 Shape 1 scant tablespoon dough around each milk chocolate candy, covering completely; roll in hands to form ball. Place on ungreased cookie sheets. Bake 8 to 12 minutes or until set and bottom edges are light golden brown. Cool 1 minute; remove from cookie sheets. Cool completely, about 15 minutes. Lightly sprinkle cooled cookies with powdered sugar. In 1-quart saucepan, melt chocolate chips and shortening over low heat, stirring until smooth; drizzle over each cookie.